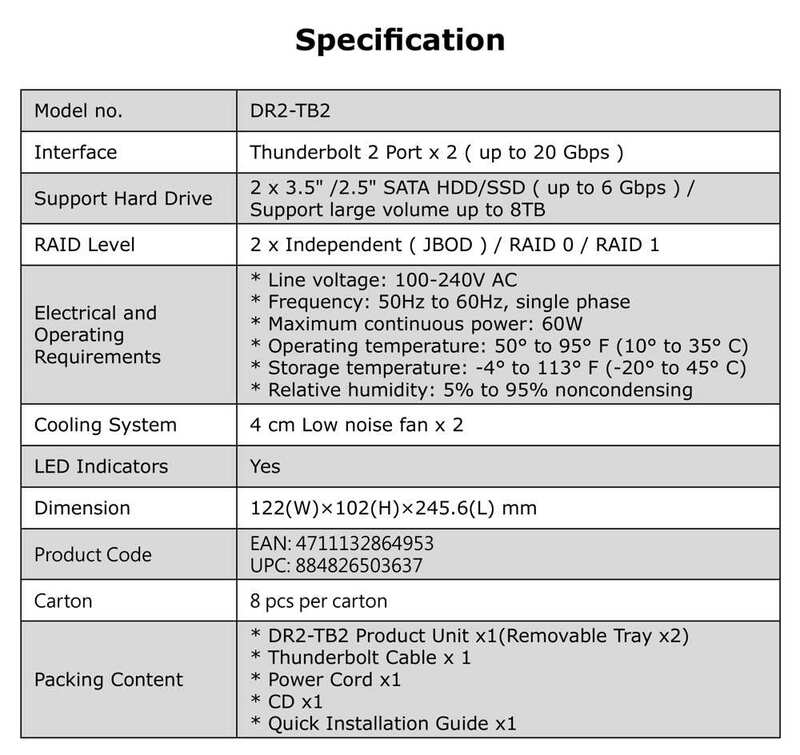 Stardom, a brand from Raidon Technology, Inc., announces the 2-bay Thunderbolt 2 hardware RAID storage - DR2-TB2, it embedded with 60W PSU (power supply) inside and comes with a metal grip handle for user to travel with it. TheDR2-TB2 has tower type design outside looking and comes with dual Thunderbolt 2 ports, it supports daisy chain to lconnect up to six Thunderbolt 2 devices through one cable. It supports hardware RAID-0, 1, JBOD function and embedded with 60W power supply inside. With Stardom latest tray module, user can choose to use 2x3.5" SATA drive to get the largest capacity or 2x2.5" SATA SSD to have best data transfer performance. For the user who needs to travel with data, DR2-TB2 is designed with one metal grip handle on it. With the internal 60W power supply and this handle, user can take it for travel. It will be a storage which meets the demand of audio and photo editing.